1 Czechoslovakia split into the Czech Republic and Slovakia; see Velvet Divorce. 3 Also .eu, shared with other European Union member states. 4 Shared code 42 with Czech Republic until 1997. Slovakia (Slovak: Slovensko) (Official name The Slovak Republic, Slovenská republika) is a country with no access to the ocean in Central Europe. It is bordered by Austria in the southwest, Hungary in the south, Ukraine in the east, Poland in the north and Czech Republic in the northwest. Its capital city is Bratislava. 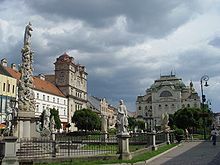 Other main cities are Košice, Banská Bystrica, Žilina, Trenčín, Nitra, Prešov, and Trnava. Slovakia is a member of the European Union. The Celts started to settle since 450 BC. The coins named Biatec represent the first use of writing in Slovakia. At the turn of millenniums, various Germanic tribes like Quadi and Marcomanni started to overtake the area. The Roman Empire established a series of outposts along the Danube river. They even fought Germanic tribes, with the most northern presence being in Trenčín (Laugaritio), during the Marcomannic Wars. The Great Moravia was at first in constant quarrels with the Eastern Francia, and at the beginning of the 10th century, with the Magyars who arrived from Asia. The Magyars beat the Great Moravia in 906, overtook the area and established the Hungarian Principality, resulting later in the creation of the Kingdom of Hungary in year 1000. Slovak settlements continued to be in the north, while those of the Hungarians were in the south. A huge population loss resulted from the Mongol invasions in 1241. The Hungarian kings started to invite other settlers, for example Germans in the 13th century, and many others started to arrive in the kingdom, Vlachs from Romania in the 14th century and Jews. The expansion of the Ottoman Empire in the 16th century from the south, who occupied the two most important towns in the kingdom, Buda (capital) and Szekesfehérvár (coronation capital) and southern regions, the center shifted to Slovakia and the capitals moved to Bratislava (Pressburg, Pozsony at that time). The fights against the Ottomans and an uprising against the Habsburgs caused a lot of destruction. After the Ottomans started to retreat back from Hungary Bratislava continued to be capital until 1848, when it was moved back to Budapest. The creation of the dual monarchy Austria-Hungary gave free hand to the Magyars, and Slovaks until 1918 were under cultural repressions from the Hungarian government, limiting the Slovak language, and promoting its Magyarisation policy. The area was a part of Czechoslovakia from 1918 to 1992. Czechoslovakia became independent from the Austrian-Hungarian Empire in 1918. The first Czechoslovakian president was Tomáš Garrigue Masaryk. Czechoslovakia split for the first time in 1938/1939, when Slovakia, with Hitler's help, became independent, though all the time until 1945, the end of the World War II was puppet ally of the Nazi Germany. Czechoslovakia was once again created in 1945, where the Communists took rule in 1948 and ruled until 1989, when the series of events, called Velvet Revolution overthrown them. Soviet inspired Czechoslovakia peacefully split into two countries (Slovakia and Czech Republic) on January 1 1993, in what became known as the Velvet Divorce. 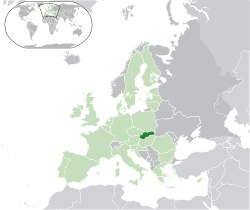 Slovakia has been a member of the European Union since May 1, 2004. Slovakia is noted primarily for its mountainous nature, with the Carpathian Mountains being in the north and various lowlands mostly in the south. The highest mountain range are the Tatra mountains with the highest peak, the Gerlachov Peak (2,654 m). Major Slovak rivers besides the Danube are the Váh and Hron. The Slovak climate is temperate, with warm summers and cloudy, cold and humid winters. About 5.5 million people live in Slovakia. Most people are Slovak (86%), but in southern regions of Slovakia live Hungarians (10%), with some municipalities even being with the Hungarian majority (for example, Komárno or Dunajská Streda), Ruthenian or Ukrainian are spoken in the northeast. A minority Roma population speak versions of the Romany language and are scattered mainly in the east. The Slovak constitution guarantees a freedom of religion. The majority of Slovaks are Roman Catholics (69%), the next are the atheists (13%). Other religions include Lutheranism, Greek Orthodox and Calvinism. There are about 5,000 Muslims in Slovakia and 2,000 Jews. Rail: Slovakia has 3,662 km of rails, of which 3,512 km are in standard gauge. Rail network currently undergoes a modernisation. Road: Slovakia has 42,993 km of roads, of which 316 km are motorways (2003). The motorway network is currently under construction. Air: Slovakia has 6 international airports, with the most important ones being in Bratislava and Košice, others are near Sliač, Poprad, Žilina and Piešťany. Marine: Slovakia has no direct access to the sea. The most important waterway is the Danube, with the ports in Bratislava and Komárno. The Danube and the Rhine-Main-Danube canal connects Slovakia to the North Sea and the Black Sea. These are further divided into many districts. There are currently 79 districts of Slovakia. ↑ "Slovakia: Ethnicity of the Population Section". Government of Slovakia. 2010. http://www.government.gov.sk/10134/slovakia.php?menu=1293. Retrieved 5 October 2010. ↑ Statistics Slovakia. Retrieved 30-06-2011. ↑ 3.0 3.1 3.2 3.3 "Slovakia". International Monetary Fund. http://www.imf.org/external/pubs/ft/weo/2010/02/weodata/weorept.aspx?pr.x=20&pr.y=12&sy=2008&ey=2010&scsm=1&ssd=1&sort=country&ds=.&br=1&c=936&s=NGDP_R%2CNGDP_RPCH%2CNGDP%2CNGDPD%2CNGDPRPC%2CNGDPPC%2CNGDPDPC%2CPPPGDP%2CPPPPC&grp=0&a=. Retrieved 20 February 2011. ↑ "Human Development Report 2010". United Nations. 2010. http://hdr.undp.org/en/media/HDR_2010_EN_Table1.pdf. Retrieved 5 November 2010. This page was last changed on 6 June 2015, at 15:58.